Look closely at this image. How would you describe what is happening? Where might this picture have been taken? How would you describe the children in this picture? How would you describe the expressions on their faces? How would you describe the adult in this picture? Who do you think he might be? What other questions arise when you examine this image? This is written on the back of the photograph you just saw. What is the name of the man in the photo? What was he in charge of? What do you think the “Children’s Village” was? Who are the children in the picture? At the time World War II broke out, there were three orphanages within California to care for children of Japanese descent (including mixed-race Japanese children) and to serve the needs of the Japanese American community. Two of these orphanages, the Shonien and the Maryknoll Catholic Home, were in Los Angeles; the Salvation Army Children’s Home was in San Francisco. The children in these orphanages were there for various reasons. Sometimes their parents died or were too ill to care for the children because of mental illness or contagious diseases like tuberculosis. Other children were there temporarily while their parents could get back on their feet again financially. 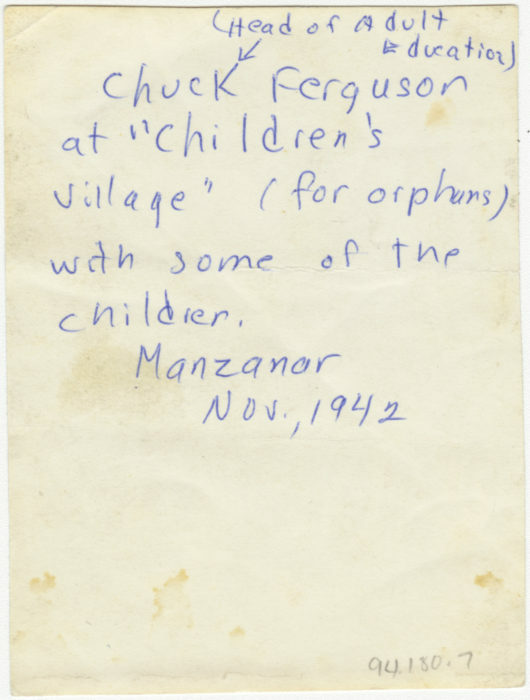 When the Japanese Americans were removed from the West Coast, Japanese American children in these three orphanages were removed and placed in the Manzanar Children’s Village. 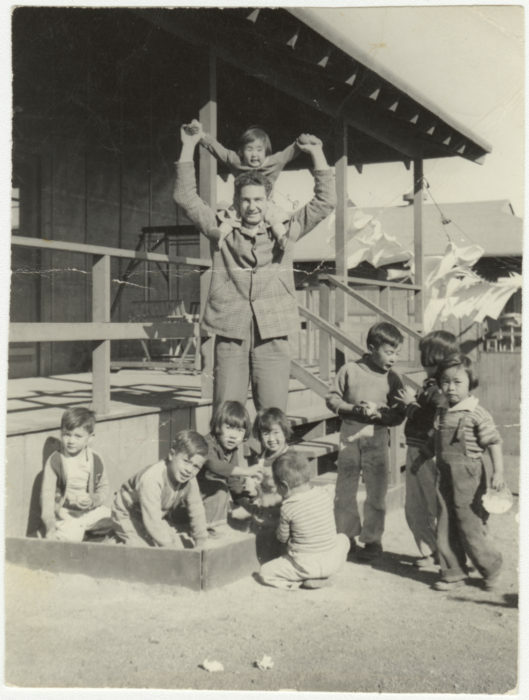 The children ranged in age from infants and toddlers to 18-year-olds, and their experiences at Manzanar varied greatly. Nearly 20 percent of the Japanese American children were of mixed race. I was in the first bus with the girls and the small children. And we entertained— The children got up and we thought it was nice and they were going to a picnic. And so they got up, sang songs and told little jokes and stories. I remember one little girl, and maybe many of you have heard this story, but she was probably about four years old. She got up and said, “I will sing.” And what she sang was “God Bless America.” She only knew the first few sentences, but a young soldier that was on guard sitting in the bus, in the front seat, shed tears when he heard this little four-year-old sing “God Bless America.” I think that was one most important things I remember of that trip. The War Relocation Authority (WRA) appointed Harry and Lillian Matsumoto, husband and wife, as superintendent and assistant superintendent of the Manzanar Children’s Village. Before departing for Manzanar, the Matsumotos had worked at the Shonien, a Japanese American children’s home in Los Angeles, alongside the Shonien’s founder, Rokuichi Kusumoto. The State of California Department of Welfare recommended to the WRA that the Matsumotos, who had graduate-level education in business (Harry) and social welfare (Lillian), be placed in charge of the children at camp. In this video clip, Lillian Matsumoto remembers taking the bus to Manzanar with the orphans. Watch the clip to hear her tell you which song one of the girls sang. 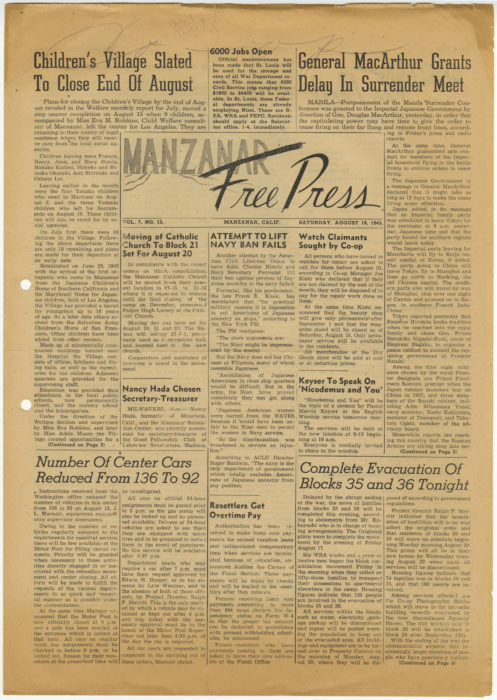 The headline of the Manzanar Free Press newspaper on August 18, 1945, reads: “Children’s Village Slated to Close End of August.” Read the article to learn more about the closing of the Children’s Village. *Lisa Nobe, “The Children’s Village of Manzanar: The World War II Eviction and Detention of Japanese American Orphans,” Journal of the West 38 (April 1999): 70. Identity is shaped by how an individual sees himself or herself in conjunction with how others perceive his or her identity. Identity can change over the lifetime of a person and is comprised of multiple things like race, class, gender, sexuality, religion, and age. The United States government classified these children as Japanese, even though some had mixed-race ancestry, and removed them to Manzanar during World War II. Many adults, who better understood the complicated circumstances these children were caught in, tried to make life as normal for the children as possible. Who can decide what your identity is? Can the government decide what your identity is? How important might your childhood experiences be to the formation of your identity? How might your experiences have unexpectedly or unintentionally influenced you? Knowing what you know about these children and their situation, how do you think they were perceived by the United States government, other adults, other children, and their teachers? How do you think the children perceived themselves?